It was an autumn day in Cleveland, 1965. 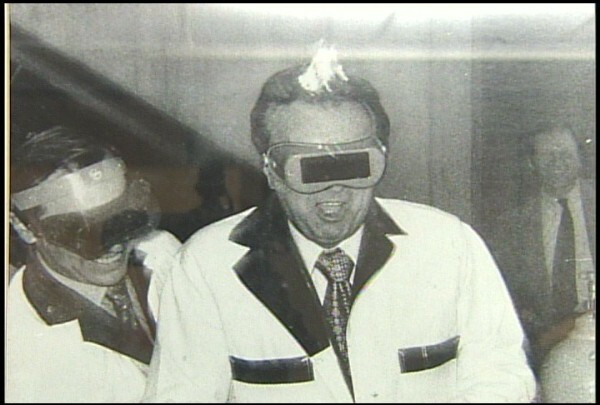 Then-mayor Ralph Perk, a man whose hair would catch fire in a welding photo-op gone badly a few years later, had just officiated the city’s first “home burning ceremony”—a new tactic of blight remediation. Perk was convinced that a “controlled burn” strategy would reduce the costs of demolishing vacant homes and help spark a resurgence of Cleveland’s real estate market, which was then beginning to founder as manufacturing jobs fled the city. The first of four houses that burned did so in an hour, “aided by a stiff breeze and 20 gallons of kerosene,” the Cleveland Press reported. This idea of restoration-through-destruction remains with us today. In a recent Atlantic piece, Galen Newman, an urban planning professor from Texas A&M, talked about the tool he was developing to help Rust Belt burgs predict which neighborhoods would empty next. “We need to accept that some of these big cities need to die,” he said. But he didn’t articulate exactly which Rust Belt cities or what parts needed to die—Detroit? Half of Flint? Ohio, save Columbus? In urban policy circles, the preferred terms for this process are “smart decline” or “managed decline.” Consider it palliative care for cities. The problem, of course, is that if you manage decline you are likely to get, well, decline. In a new study titled “Demolition As Urban policy in the American Rust Belt,” planning professor Jason Hackworth of the University of Toronto found that “there are 269 neighborhoods in 49 cities that have lost more than 50 percent of their housing since 1970.” This wave of destruction has claimed more homes than urban renewal efforts have, but it has “not led to market rebound or a decrease in social marginality.” Put another way, those Rust Belt neighborhoods with the most disassembly since 1970 didn’t get better—they got worse. Now, the operative question is, Why do cities want to manage decline when there’s little evidence it works—and abundant evidence that it makes things worse? Many Rust Belt leaders have been groomed in a vacuum: What’s possible is hard to see. During the 1970s, the city lost one out of every four people, second only to St. Louis. Making matters worse was a mid-70s Cleveland mob war: There were 21 car bombs linked to organized crime in the city in 1976, and another 16 in its suburbs, making Cuyahoga County the “car bomb capital” of America, according to statistics compiled by Alcohol, Tobacco and Firearms Unit. One can imagine how the city’s misfortunes—and the mix of fear, sadness, lost pride, and defensiveness they conspired to create—affected the city’s collective consciousness. Importantly, just as a person’s consciousness is tied to individual decisions, so too are collective experiences tied to group decisions, particularly policy. Policy, in its simplest form, is just jargon for group desire, marshaled through influential people. Desire comes down to fear or hope, as Dutch philosopher Baruch Spinoza famously insisted. When fear is your dominant driver, the policy becomes one of scarcity and security. When hope is dominant, the policy is viewed through possibility and aspiration. The key, here, is while “serious” policy decisions are supposed to be “smart,” they are derived viscerally. No wonder so many gut decisions on things like urban renewal end poorly. Perfecting managed decline is an example of the “fallacy of the first attitude,” a term Lewis Mumford used when describing how leaders make decisions on the assumption that yesterday’s trend lines will carry on indefinitely. But we don’t know the future. Rust Belt cities need to stop planning that there isn’t one. Of course, the fallacy cuts both ways: In 1962, for instance, Detroit leaders had the hubris to assume that good times would go on unending, ignoring the “precarious balance … between composition and decomposition” that began the city’s teetering toward bankruptcy, notes David Maraniss in his book Once in a Great City. Meanwhile, a recent Moody’s report ranked the top fifteen U.S. cities with the largest unfunded pension liabilities in the nation. Four Texas cities made the list. Which raises the question: When will we be being asking which parts of Texas “need to die off”?